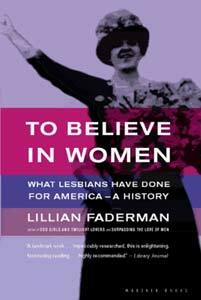 TO BELIEVE IN WOMEN: What Lesbians Have Done For America-A History. By Lillian Faderman. 480 pgs. "From the author of the acclaimed Odd Girls and Twilight Lovers, a landmark work of lesbian history that both "setts the record straight (or unstraight) for all Americans and "provides a usable past" for lesbians. "This is a book about how millions of American women became what they are now: full citizens, educated and capable of earning a decent living for themselves. But it departs from other such histories because it focuses on how certain late-nineteenth - and early-twentieth century women whose lives can be described as "lesbian" where in the forefront of the battle to procure the rights and privileges that large numbers of Americans enjoy today." A groundbreaking reappraisal of those women known by history but whose histories are incomplete, To Believe In Women examines how their lesbianism may in fact have facilitated their accomplishments. Lilian Faderman, twice winner of the Lambda Award, persuasively argues that even before a "lesbian identity" was defined, many early female leaders had what would now be called lesbian relationships, free form the constraints of traditional heterosexuals arrangements that might otherwise have impeded their pursuits in education, politics and culture. A book of impeccable research and compelling readability, To Believe In Women will be a source of enlightenment for all, and for many a singular source of pride".